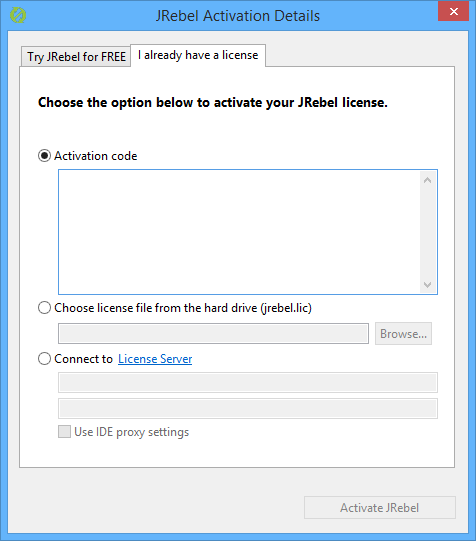 In case of IDE plugins, the JRebel license activation is performed by a configuration window inside the plugin. In case of a standalone distribution, a special utility provided with the ZIP archive is used for license activation. Extract the archive to a location of your choice. Within the extracted contents you will find a folder titled bin. You can start the activation utility by running activate-gui.sh script in a *nix environment. When using Windows, run activate-gui.cmd. The JRebel Activation wizard will open. This window contains two tabs – Try JRebel for FREE and I already have a license. 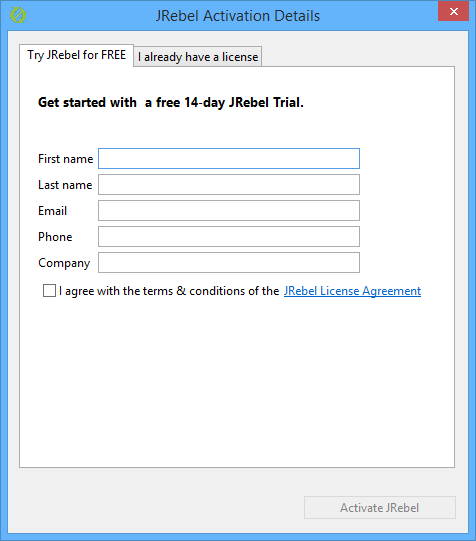 To start your 14-day free JRebel Trial, fill out this form, select I agree with the terms & conditions of the JRebel License Agreement and press Activate JRebel. It’s as easy as that! Activation code – Select this and paste your trial activation code in the text field. Press Activate JRebel to activate using the activation code. Choose license file from the hard drive (jrebel.lic) – Select this option if you bought a license. We will send you a jrebel.lic license file using email. Press Browse and locate your jrebel.lic license file on the hard drive. Next, press Activate JRebel to activate using the license file. Connect to License Server – Select this option if your network administrator supplies you with a License Server Group URL. The Group URL is a unique URL, consisting of the License Server address and a unique key. Paste the Group URL into the first field and input your email address into the second. Press Activate JRebel when done to activate using the License Server. JRebel 6 requires License Server 3 or newer for activation. The bin directory contains a script that can be used for license activation via the command line, i.e. in headless environment. To activate from command line, start the activation utility by running activate.sh script in *nix environment or activate.cmd in Windows environment. Specifying the user email is required when activating with a license server URL.